Andrew Jackson, the nation’s seventh president, was known for his toughness – both during warfare and in the political arena. As a military man, Jackson served with courage and tenacity in the American Revolutionary War, the War of 1812, the Creek War, and the First Seminole War. During the War of 1812 Jackson’s men admiringly called him “Old Hickory” because he was as tough and strong as a piece of that legendary wood. After Jackson was elected president in 1828, he brought to the White House his well-earned reputation as a fierce warrior. Who would be crazy enough to try and attack such a formidable fighter? Well, the answer is just that – a crazy man – because during Jackson’s second term, a man later determined to be criminally insane tried to kill him. On 30 January 1835, Richard Lawrence fired two pistols point-blank at Jackson, the first attempted assassination of a president in U.S. history. 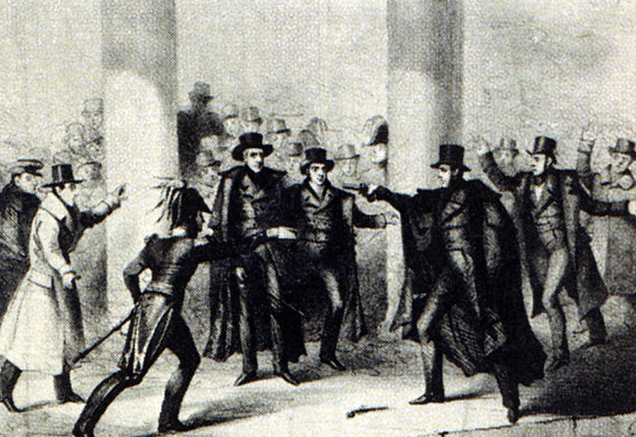 Illustration: an 1835 etching of the attempted assassination of President Andrew Jackson. Credit: Wikimedia Commons. What did Jackson, the old warrior, do? The 67-year-old president raised his cane and rushed his attacker, but not before Lawrence pulled out a second pistol and fired another shot directly at the president’s breast. Somehow, miraculously, although both percussion caps exploded, both pistols misfired and no ball came out. The president, unharmed and with the aid of fellow tough Tennessean Davy Crockett by his side along with several others, subdued the assailant. 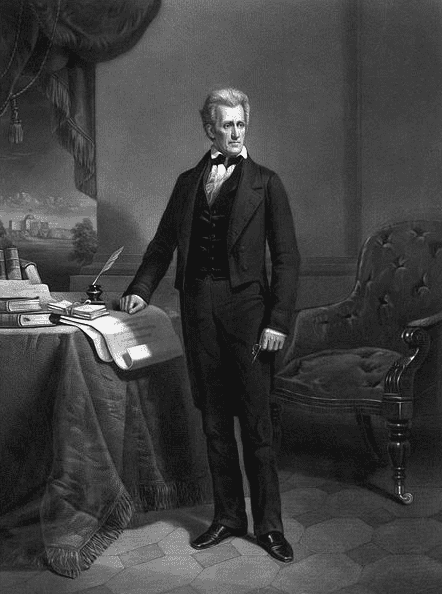 Illustration: portrait of President Andrew Jackson, by Dennis Malone Carter. Credit: Library of Congress, Prints and Photographs Division. Jackson was not only tough – he was very, very lucky. The pistols were found to be in excellent working order, and in subsequent tests fired perfectly every time. But when Jackson’s life was on the line, divine intervention, plain good luck – or perhaps the humid weather – saved him. During his trial Lawrence was declared criminally insane and was institutionalized for the rest of his life. He died at the Government Hospital for the Insane (later called St. Elizabeth Hospital) in Washington, D.C. in 1861. From the Washington correspondent of the Baltimore Gazette. The funeral obsequies of the Hon. Mr. Davis were celebrated in the Hall of the Representatives this morning, in the presence of both houses of Congress. 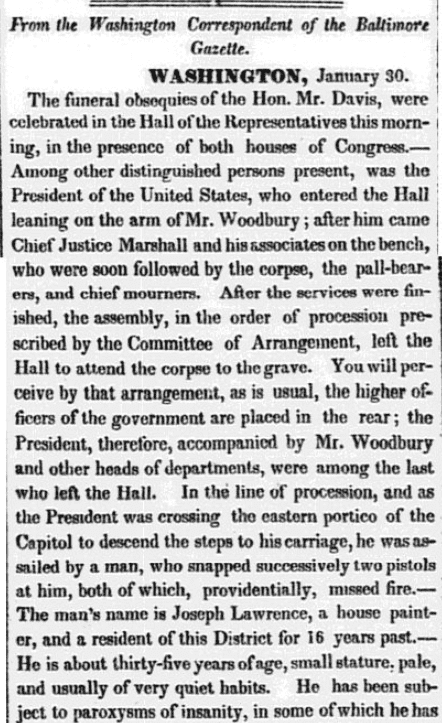 Among other distinguished persons present was the President of the United States, who entered the Hall leaning on the arm of Mr. Woodbury; after him came Chief Justice Marshall and his associates on the bench, who were soon followed by the corpse, the pall-bearers, and chief mourners. After the services were finished, the assembly, in the order of procession prescribed by the Committee of Arrangement, left the Hall to attend the corpse to the grave. You will perceive by that arrangement, as is usual, the higher officers of the government are placed in the rear; the President, therefore, accompanied by Mr. Woodbury and other heads of departments, were among the last who left the Hall. In the line of procession, and as the President was crossing the eastern portico of the Capitol to descend the steps to his carriage, he was assailed by a man, who snapped successively two pistols at him, both of which, providentially, missed fire. The man’s name is Joseph [correction: Richard – ed.] Lawrence, a house painter, and a resident of this District for 16 years past. He is about thirty-five years of age, small stature, pale, and usually of very quiet habits. He has been subject to paroxysms of insanity, in some of which he has attempted both his own life and that of his sister, who is a respectably married woman of this city. It is said that he has been already in confinement for his insanity, but his good behavior obtained his liberation, and he has been since often observed as a well-dressed vagrant about the Capitol and the streets of the city. He was observed to be prowling around the columns of the Hall during the services of the day, but did not come within the railing near the members’ seats; his hand was held inside his vest, as if grasping something, and his lips were pale and quivering. He went out by a side door as the assembly broke up, met the President on the portico, and standing about six feet from him, deliberately pulled two pistols from his breast and fired them at the person of the President, both of which, though with percussion caps, and doubly charged, missed fire. The President immediately raised his cane to strike his assailant, but before the blow could descend upon him, he was thrown down upon his back and secured. His pistols were taken from him, and found to be a very elegant pair, in most excellent order, and loaded with powder and ball almost up to the muzzle; the barrels being about six inches long. Other balls and percussion caps were found upon him. He is English by birth, and says in his defence, that Gen’l. Jackson killed his father – he probably refers to some battle in which he lost his parent, and in which Jackson commanded. At the moment of the occurrence, the excitement was tremendous, and the indignation of the crowd so great, that, but for the protection of the Marshal of the District of Columbia, the poor wretch would have been murdered upon the steps of the Capitol. He was hurried away to a carriage, and thence to the City Hall to be examined, and has been since committed to prison. I chanced to be stepping from the rotunda upon the portico at the moment after the attack, and saw a dense crowd, all in confusion, rushing towards me; and over all others the President raised his arm and his voice, saying, “Let me go, gentlemen – I am not afraid – they can’t kill me – I can protect myself.” He was assured by his attendants that all were his friends around him, and he immediately proceeded to his carriage, and went to the funeral. Col. Crockett, who aided in securing the prisoner, cried out, “I wanted to see the d—mnd–st villain in this world – and now I have seen him.” It is a most astonishing circumstance, loaded as they were and with percussion caps, that these pistols missed fire; perhaps it was because the air was loaded with moisture, which spoiled the caps. Everybody declares that against the Old Chief no firearms will take effect; and it is proposed, as an experimentum crusis, to put new caps to these same pistols, with all the charge which they contained, and fire them at somebody else, to prove, by this means, his invulnerability. Note: An online collection of newspapers, such as GenealogyBank’s Historical Newspaper Archives, is not only a great way to learn about the lives of your ancestors – the old newspaper articles also help you understand American history and the times your ancestors lived in, and the news they talked about and read in their local papers. President Jackson was with a guy that killed a bear when he was only 3 years old! Richard Lawrence is lucky he didn’t get a tomahawk in the forehead from Col. Crockett! Don’t mess with those tough Tennesseans! The Cherokee wish the assassination attempt would have been successful. Every year the Cherokee hold a special place and ceremony for Jackson. Jackson was a dirty rotten scoundrel for what he did to the Cherokee People. YES HE WAS Douglas. Can’t stand even his name. This was a very interesting piece of information not in school books. I truly enjoyed the article. Thank you for your kind words, Arthur.